Over the past 12 months I’ve been pointed numerous times to a passage in James chapter 5. This is an important and puzzling part of the Bible. It seems to make bold promises and yet, so often, doesn’t seem to deliver upon them. Is this because we’ve misunderstood the text? Is it because we’ve misapplied the text? This part of the Bible has had me curious for many years. I’m not sure I’ve ever been completely satisfied with any of the commentary explanations. Is it a prescription for healing today? Should we follow the advice to apply oil, call the elders, confess sins and pray for healing? Should we have the faith that the sick person will be healed? Is this a promise of healing to the person who has repented of their sin? My cancer has given me cause to reflect more seriously on these words of God. Over the years I’ve been called on a few times to pray for a seriously ill Christian and anoint them with oil. Earlier this year some of our pastors and elders prayed over me and anointed me with oil. Does this mean that I should expect to be healed from my cancer? Others have had similar experiences and haven’t been healed. What do we make of this? A pastor friend took me to this passage while I was still in hospital last year and asked me to consider if there might be any sin that is causing my sickness. The truth is I can think of so many sins! But how would I know what sins might be serious enough to lead to serious sickness. And I trust God that he has accepted payment for all my sin in Christ. And I don’t think there is anything for which I remain unrepentant. But it’s also the exegesis of this passage that puzzles me. So many commentaries see little or no links in the immediate and wider context, and this bothers me because it seems unlikely that James would drop a new and unrelated exhortation at the end of his letter. I wish to explore the meaning of these verses further and to ask whether it is possible to see a coherent argument from 5:7-20. So here are some of my thoughts for consideration. In these verses, one English word ‘sick’ is used to translate two different Greek words: astheneo (5:14) and kamnonta (5:15). For we do not have a high priest who is unable to sympathize with our weaknesses, but one who in every respect has been tempted as we are, yet was without sin. 14 Is anyone among you weak? Let him call for the elders of the church, and let them pray over him, anointing him with oil in the name of the Lord. 15 And the prayer of faith will save the one who is weary, and the Lord will raise him up. And if he has committed sins, he will be forgiven. Of course, there are other issues to be determined in these verses. How is ‘save’ (Gk. sozo in 5:15) being used? The NIV translates this word as ‘make well’, whereas the ESV translates as ‘save’. Does it refer to salvation from illness and death? Or is it speaking of salvation from God’s judgement? James uses this word on four other occasions and each time it refers to spiritual salvation. Most telling, is the proximity of 5:20, which I would argue is a continuation of the same discussion by James. Thus, James could be saying that the prayer will restore the weak and weary person so that they will be saved from the judgement of God. The reference to healing (Gk. iaomai in 5:16) could then be understood to be functioning metaphorically, as it does in Isaiah 53:5. That is, the person is healed from their sin. Interestingly, in Hebrews 12:13 this word is used for ‘the healing of drooping hands and weak knees’. This is a picture of restoring the person who has grown weary and faint-hearted (Hebrews 12:3) in their struggle against sin. The same idea could well be on view in James 5. This interpretation fits well with the context and helps us to see the development of James’ argument. In 5:7-11 James writes about the attitude his brothers and sisters should have toward suffering. They are exhorted to be patient and to persevere. They are to find encouragement in the example of the prophets (Job is noted) and the merciful character of God. This has an eschatological focus in the return of Christ and the final judgment. James 5:12 is harder to understand in the flow of James’ argument and is usually explained as an isolated saying. However, it’s possible that James is returning to his warnings about double-mindedness and his encouragement to his brothers and sisters to remain steadfast. 5:13 continues the matter of remaining godward in the face of suffering and trials, by encouraging the suffering person to pray. If the praise is also godward, then he encourages people to speak with God in good and bad circumstances. But what of the weak person, the spiritually weary, the one who may be unable to pray in faith? Let him call the elders to pray so that he may be restored. Indeed, prayer is not limited to the elders. Prayer is something we should offer for one another, especially when they need help in overcoming sin. This whole argument is nicely concluded and summarised in 5:19-20 where we see that the heart of the matter is saving the sinner from his sin that leads to the death of his soul. But what of Elijah in the midst of all this? Again, the reference to Elijah points to the continuity of argument, because the example of the prophets has already been raised in 5:10. Elijah serves as an example of a righteous pray-er. His ministry occurs during the time of drought and he is introduced in these terms in 1 Kings 17:1. For three and a half years the people have to wait, and the cause of the crisis is the sinfulness of the people of God. In particular, it is their double-mindedness as they flirt with other gods and fail to trust God’s covenant promises. This fits well with the introduction to this section of James, where in verse 7 the farmer waits for the rains, which are the coming of the Lord. 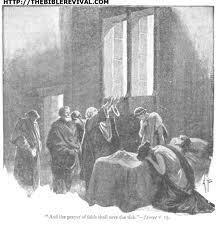 1 and 2 Kings reveals that Elijah was a man who prayed, but the prayers recorded are interesting. He prays for a little boy to be saved from death to life – and he was. A powerful prayer for healing, but James does not mention this. So, I understand the connection to be humble faith in God, as we wait patiently for him to bring the rain, or in the case of James – the return of Jesus. This still leaves the puzzling reference to ‘anointing with oil’. The New Testament only mentions the practice of anointing with oil in relation to healing the sick in Mark 6:13. (There is also the reference to pouring oil and wine on the bandages of the good Samaritan in Luke 10:34.) So, it could be that a connection with healing prompts the mention of anointing with oil. This, on my view, could be a symbolic demonstration of God’s spiritual healing of the individual. This ‘restoration of the weak and weary’ view fits well with the overall message of James. People become weak and weary when they fail to submit humbly to God’s word. Rather than strengthening their hearts (5:8), they become faint-hearted and weary of struggling against sin. They become double-minded, being tempted by the world’s ways rather than patiently trusting in the goodness of God. James began his letter by calling upon people to remain steadfast under trial. They are to persevere patiently because God has promised a crown of life. James concludes his letter by returning to where he started. His big concern is that people live out their faith and not fall by the way, distracted by the pretence of the world. They are to keep trusting in God, come what may, and if anyone starts to stray, then their brothers and sisters should pray and do all they can to bring them back. I recognise that this interpretation is not watertight and there have been various arguments against it. Commentators point to the calling of the elders as indicating the incapacity of the sick person to go themselves to the elders. The strong connections with Jesus’ teaching are seen as a pointer to the sickness/healing/saving theme of the gospels being repeated here. Further, the place of anointing with oil in a context other than healing is hard to explain. I have weighed these arguments (and will continue to do so) and it seems to me that in the context of James’ letter ‘restoring the weary’ is a more likely interpretation than healing the sick. If I am wrong, then it is still likely that James explores a link between the weakness/sickness of individuals and the potential of sin having brought this about. Thus the prayer and concern for the sick person will be concerned with more than their physical healing. It will be concerned with the forgiveness and salvation made possible through Christ. My recent experience of serious sickness has reminded me of the strong connections that can exist between physical sickness and spiritual struggle. Someone who is very ill and facing their own mortality may experience doubt and a struggle to maintain their faith in Christ. In such circumstances the prayers of the elders and encouragement of God’s people will be particularly important. In all of this, I continue to pray fervently for others to be healed of their sicknesses and that God will strengthen their faith in him for salvation. I deeply appreciate the thousands of prayers that people have offered for my healing. Please don’t stop! Let’s pray to God, let’s pray for one another, especially for the sick and weary and weak and struggling, that God will raise them up. When things are especially tough, the prayers of our brothers and sisters are so important. These reflections are a work in progress. I have grappled with this text over a number of years (preceding my illness) and recent events have pushed me to explore their application again. My prayer is that we will read them humbly and faithfully, leading us to trust God in whatever circumstances we are facing. I welcome your thoughts and prayers! Hi Dave, great analysis. Your conclusion is supported at least by google ‘james 5 sick weary’! The interpretation of this passage has really important pastoral ramifications – which is where you’re coming from. Taken the way you suggest, it elevates pastoral ministry by elders to the spiritually weak and weary. In my experience, the common practice is not for elders to go and pray for the physically sick and anoint them with oil. Does this mean the church generally agrees with your interpretation, or is often ignoring this Scripture? Thanks Dave, for a valuable combination of careful reading with the authority that comes from experience. May I presume to add my 10 cents worth? Basically I agree that the more you take the chapter as a unit the harder it is to reduce the healing James has in mind to physical healing, or to immediate healing. But neither do I think we should rule either of these out. What strikes me every time I read it is the way the exhortation to pray for the sick/weak is bracketed by images of rain, which I think gives us the permission we need to read vv. 13ff in the light of the earlier section. Healing, like rain, comes from God, and the prayers of the righteous are powerful because God hears them. The believer who is suffering will be raised up, though (like the farmer) he may need to wait for the coming of the Lord, and whether he is raised early or late, the prayers of his Christian brothers & sisters will help to ensure God raises him (or her) freed from everything: sin, weariness, bodily sickness. I think we tend to separate sin, sorrow and sickness more strongly than the ancients did. I supect that James stresses patience, faith and waiting because he knows (as the prophets of old knew) that we will not finally be free of sin, sorrow or sickness until the Lord returns. And a thought about the oil – could it be like the rain again: an image of refreshment and joy descending from God? I’m thinking of the Psalms, where oil connotes these exact things (Pss 23:5; 45:7; 133:1-3). Is anyone suffering from sin or weariness or bodily sickness? Let the elders anoint him with a sign of God’s joyful, life-giving power, and pray, knowing that at the right time God will delight to raise him up.